﻿"The Stations of the Cross"
Holy Week is here. It begins this Sunday with the children’s palm processional. In worship we’ll be guided by story, music, and image to ponder how the sacred story of Jesus’ final days resonates with our own lives. On Good Friday, April 19th, at 6:30 p.m., the youth who have participated in the Embark spiritual formation class this fall will present a project expressing something of their spiritual perspective at this point in their lives. It could be a dance, a piece of art, a story, a food thoughtfully prepared. Anything that reveals something deeper in them. And then, after a week of intentional, thoughtful spiritual reflection, we gather for a celebration. Easter Sunday is a highlight of the church year – joy-filled and satisfying – with the enduring and hopeful sacred story, beautiful music, celebration in community. Oh, and Easter eggs. Lots of Easter eggs. Don’t miss out on your chance to participate in one or all of these events. And during the coming week, and always, may the peace of Christ surround and nurture you, step by step even through your most difficult days. I am so grateful to walk with you. 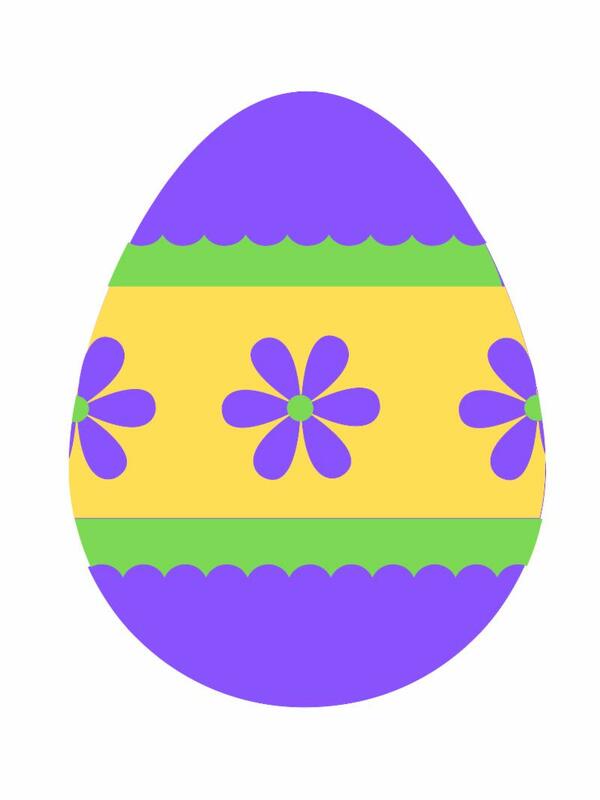 We need donations of coins, individually wrapped candy, tattoos, and stickers to fill the eggs for the Easter egg hunt. There is a basket in the foyer to receive donations. MAUNDY THURSDAY: We will have our annual Maundy Thursday Dinners on April 18th . This year's hosts will be Rhonda Grundy (east side of town); Veronica and Joel Penrod (west side of town); Shelby and Bart Shafer and Heather and Brian Goolsby (kids and youth); and Lisa November and Rev. Lee Ann (newcomers). The event is potluck with a special communion service held after the meal. NOTE: You are free to choose which host and location you prefer. GOOD FRIDAY: On Good Friday , April 19th , 6:30 p.m., there will be a special presentation given by our youth who have participated in the Embark program. Embark is a journey of spiritual questioning where our youth learned about such topics as the Christian faith, world religions, the legacy of FCC, and service to others. Participants were asked to create something that is a reflection or interpretation of what they learned, and those presentations will be made--gallery style--on Good Friday. Everyone is encouraged and invited to attend. EASTER SUNDAY: Please join on us Sunday, April 21st , for Easter Sunday. In addition to our flowering Easter cross, there will also be an Easter egg hunt for our littles and a scavenger hunt for our youth. It is always a meaningful service and we hope you'll join us. Could it be that we are all just a little bit racist? Could this be the reason that wherever we go, racism always seems to be there as well? Could this be the reason that racism and religious and ethnic intolerance seems to appear in nearly all nations where ethnic and religious differences exist? Could it be that racism is a primitive behavior like cannibalism except, for some reason, we’ve not quite yet overcome racism? Beginning on Sunday, April 28th , during the Education Hour, FCC will host a Racists Anonymous Group that operates under the same principles as Alcoholics Anonymous and other 12-step programs. The group will be led by members of the congregation and is open to the church and community. The goal of RA is not to change others. The goal of RA is to, with God’s help, eliminate racism in ourselves. First Congregational Church will host a free four-hour training course in Stop the Bleed (STB), CPR, and Civilian Response to Active Shooter Events (CRASE)--all skills aimed at empowering bystanders, through proper training, to intervene in an emergency until professional help arrives. The course is presented jointly by the Harris Hospital Trauma Administration staff and the Fort Worth Police Department. Note: By necessity, some of the training slides and videos are graphic. Stop the Bleed (STB) is national awareness campaign that teaches community members how to render immediate, potentially life-saving medical aid in the event of a bleeding emergency. There will also be a training segment to learn critical hands-only CPR skills. Civilian Response to Active Shooter Events (CRASE) is a course that teaches individuals in the community how to prepare for, and defend themselves during active shooter events. If you would like to attend, please contact the office . 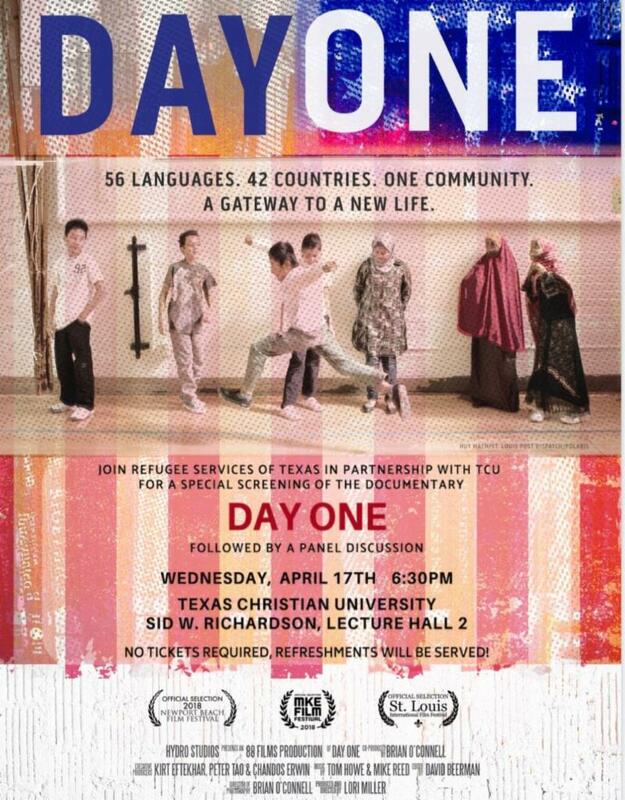 Refugee Services of Texas is hosting a screening of the documentary Day One on Wednesday, April 17th , at 6:30 p.m., at the Sid W. Richardson Lecture Hall 2. Adventure Villagers will meet upstairs in the Adventure Village classroom where they will talk about Palm Sunday. Youth are getting together to continue their Lenten discussion. Adult Ed welcomes back our own Rev. Peter Nichols to talk about the United Church of Christ. Have you wondered, "What is this United Church of Christ?" The class will continue exploring who we are as a part of the North Texas Association locally, the wider South Central Conference, and the history of the United Church of Christ which has been around even before there was a United States of America. Peter will keep it light while sharing who we are, where we come from, and how we are organized in the UCC. Peter Nichols is an ordained minister in the United Church of Christ. His face may not be familiar because in retirement (since moving back to Texas) he has been an interim minister at Friedens UCC in Geronimo (near New Braunfels); at First Community UCC in Dallas; and most recently at St. Paul's E&R Church, also in Dallas. Peter is married to Betty, and they have three daughters, including Christy Alvear and her husband and daughters who are part of this congregation. Peter grew up in Ohio; met Betty at College in Abilene; and is a graduate of Lancaster Theological Seminary, Lancaster, Pennsylvania. He has served churches in Ohio, Michigan, Pennsylvania, and Texas. He has served in many parts of the wider church and looks forward to sharing some of these stories with you. CULTIVATING MINDFULNESS, Wednesdays, Chapel, 8:30 a.m.; Saturdays, 10:00 a.m., Parlor Please join us Wednesdays at 8:30 a.m. in the Chapel or Saturdays at 10:00 a.m. in the Meditation Room for walking, sitting, and guided meditation in the tradition of Thich Nhat Hanh. Our Wednesday group consists of 10-minute periods of silence, walking, and guided meditation on a "come-and- go" basis. So if you have anywhere between 10 and 60 minutes for meditation, please come join us! It's that easy. Just call Lisa November (817-807-0890) when you arrive at the front door and she will let you in. TONIGHT'S SCHEDULED EXECUTION HAS BEEN STAYED, SO NO VIGIL. The Coalition for Aging LGBT invites you to join them on Saturday, May 4th for Spectrum Ensemble's premier concert at Denton Black Box Theater in Denton. Spectrum Ensemble is celebrating the start of their journey advocating for increased LGBTQ representation in classical music. A portion of the proceeds will be donated to the Coalition. 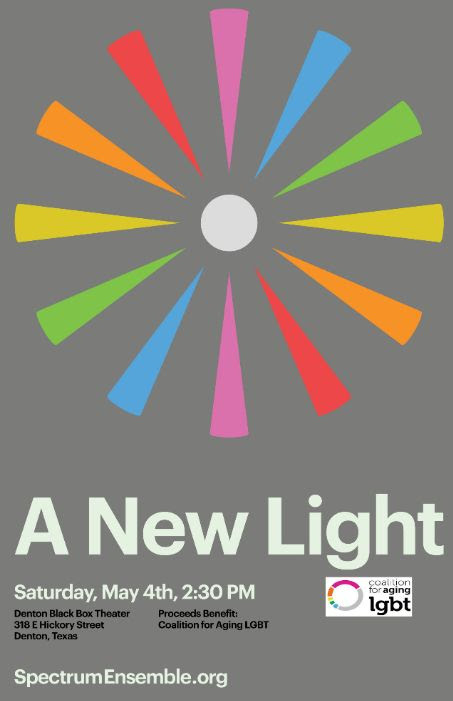 In this program, Spectrum Ensemble will perform world premieres of works specially commissioned by four wonderful Queer composers who produce some of the most exciting new music of our time, along with some of your favorite composers like Leonard Bernstein and Samuel Barber. 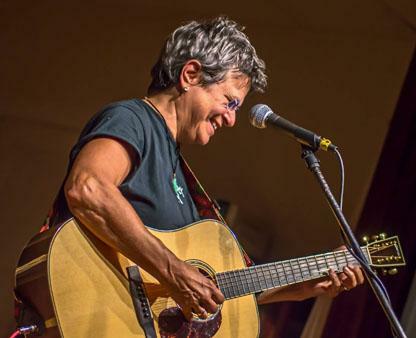 By drawing attention to the lineage of Queer composers through the last century, Spectrum Ensemble shines a new light on the significance of LGBTQA+ individuals in the world of classical music. Tickets at the door: $20 for adults, $10 for students with ID, Kids 12 and under free. Christian Care Hospice, in conjunction with Dementia Friendly Fort Worth, and James L. West Alzheimer's Center, is hosting a Grief and Loss Symposium on Friday, April 12th, from 8:00 a.m.-3:00 p.m. You will hear experts in the area of grief share personal stories and experiences with families, as they cover topics such as children’s grief, caregiver and patient grief, along with an open panel discussion on presenting bad news. For more information, please visit their website at and select the “Grief & Loss Symposium” tab, or call 817-496-4730. You are invited to Be All You Can Be at the 2019 South Central Conference Women's Retreat at Slumber Falls Camp in New Braunfels on April 26th-28th. visit the outlets (on your own time). The cost is $100. Click here for more information and to register. If you already use AmazonSmile, would you consider making "First Congregational Church UCC Fort Worth" your charity of choice? SPREAD THE WORD! 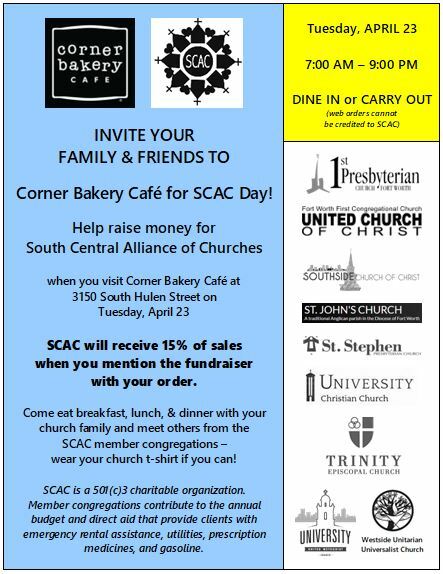 Share this information with your family and friends who might want to help support our church! 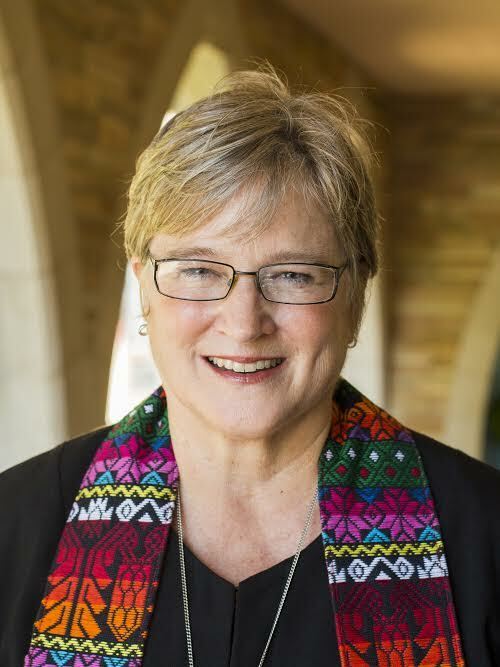 In May 2008, we declared: We, the congregation of First Congregational United Church of Christ, Fort Worth, declare ourselves to be Open and Affirming. We strive to be a congregation that includes all persons, embracing differences of sexual orientation, gender and its expression, marital status, age, mental and physical health and ability, racial and cultural identity or background, and educational or socioeconomic status. We welcome all to share in the life, leadership, ministry, fellowship,worship, sacraments, responsibilities, blessings, and joys of our congregation's life in Christ. Audio of Rev. Lee Ann's Sermons: Click here. 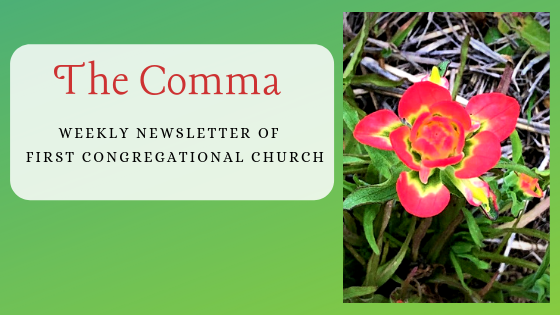 Articles for The Comma and announcements for the bulletin must be in to the office via email no later than Wednesday mornings. For events to be published on our Facebook page, please email the office with the details. PLEASE NOTE: Articles and announcements may be edited for length, grammar, etc. We frequently take photos or videos of all the wonderful events happening in our church. If you prefer we do not include photos of you or your family in our bulletin or on social media, please let the church office know. We will be happy to honor your request. 1) Go to our web page fortworthucc.org click on "Giving" menu, then click on the "Give Now" button. 2) Once on the Vanco website, set up an account, and decide where you want your donations to go, how often, and from what account. PLEASE NOTE: Credit/debit transactions incur fees payable to the credit card company. FCC will record the amount less the fees for IRS purposes.